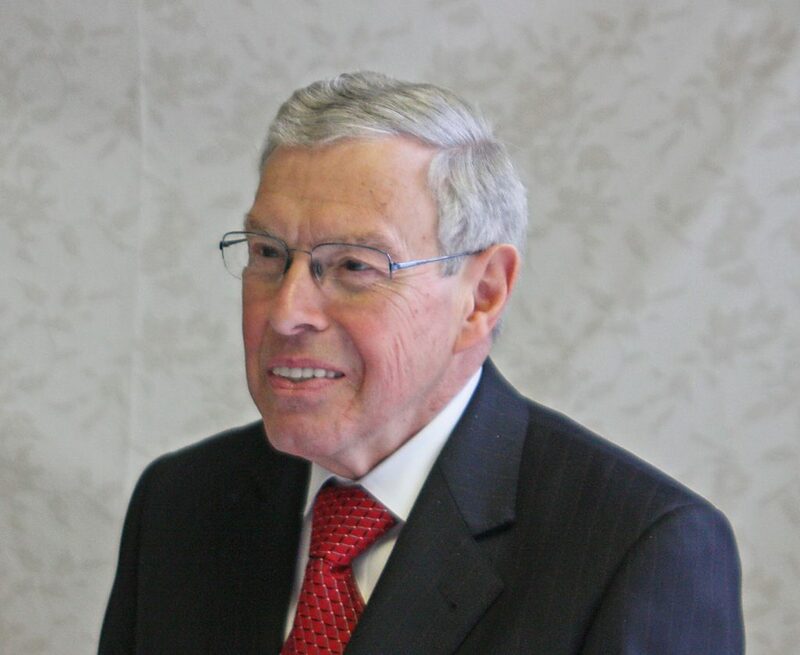 Graham Atwell Long, the retired CEO and President of the Dedham Cooperative Bank for 41 years until his retirement in 1999, died Saturday, January 26, 2019 at Wingate Assisted Living and Memory Care facility in Needham after a long illness. He was 83. Graham was born November 4, 1935 in Norwood, Massachusetts, one of the three sons of Alton Roy and Lillian Elizabeth (Graham) Long. He graduated from Westwood High School with the Class of 1953 and then from Boston University with the Class of 1957 when he earned his Bachelor of Science degree. In 1967 he graduated from the American Savings and Loan Institute. Graham was President of the Dedham Cooperative for 24 years and was only the 5th president in the banks 115 year history. Faith was an important part of Graham’s life. He was a very active member of the First Baptist Church of Westwood, having attended the church since he was 1 1/2 years old. He served as the church moderator for many years, and had been the chairman of the Board of Deacons and of the Missions Board, financial secretary, and a trustee. Graham also had the honor of being the only member of the church granted a license to preach, and, as a lay preacher, he led the Maundy Thursday morning services for over 20 years. Graham was also very active in Masonry. He was a Past Master of Constellation Lodge AF & AM of Dedham, and a Past Deputy Grand Master of the Grand Lodge of Massachusetts. He also was a member of master’s Lodge in Needham, and of St. Bernard Commandery #12 of Boston. Graham was also a Director of the International Union of Building Societies and Savings Associations. Graham had a passion for travel and called it his hobby. He traveled throughout the world to Europe, South America, Africa, Australia, and China, (where he walked the Great Wall), enjoyed multiple cruises and transatlantic crossings on the QE2, and had a special love for the City of London. Music was another love of Graham’s. He played the piano and organ and spent many treasured evenings at the Boston Symphony Orchestra concerts. Every spring Graham’s yard would blossom with a beautiful abundance of tulips. Graham is survived by his brother, Norman G. Long of Natick; his niece Janice Cavanaugh, and her husband Patrick, of Natick; his nephew, Jeffrey Long, and his wife Joanne, of Myrtle Beach, SC; his sister-in-law Barbara Long of Brewster; as well as seven grand nieces and nephews, and many dear friends. Graham was the brother of the late Alton R. Long. Visiting hours will be held Friday, February 1st, 2019 from 9 to 11 am at the Folsom Funeral Home, 649 High Street, Westwood followed by his funeral service at 11:30 am at the First Baptist Church, 808 High St, Westwood. Interment will be in Old Westwood Cemetery. In lieu of flowers donations to the Graham Atwell Long Scholarship Fund, c/o Grand Lodge of Masons in MA, 186 Tremont Street, Boston, MA 02111, or to the Memorial Fund of the First Baptist Church, 808 High St, Westwood, MA 02090, or to the Salvation Army Fund, 25 Shawmut Road, Canton, MA 02021 would be appreciated. Graham had a passion for travel and called it his hobby. He traveled throughout the world to Europe, South America, Africa, Australia, and China, (where he walked the Great Wall), enjoyed multiple cruises and transatlantic crossings on the QE2, and had a special love for the City of London. Music was another love of Graham’s. He played the piano and organ and spent many treasured evenings at the Boston Symphony Orchestra concerts. Every spring Graham’s yard would blossom with a beautiful abundance of tulips. A truly wonderful person and fried. Graham will be deeply missed by all who knew and loved him. Graham was one of a kind, most definitely a people person. A special friend and wise individual. Advised me as the trusted banker he was for many years. The fact that Dedham Cooperative had to hire two individuals to replace Graham when he retired says it all! I can still picture him “flying” through Dedham Square. He will be missed. Graham was one of the true leaders at First Baptist Church who led by example. Over the years that I participated in the church I cannot count the number of times that we were trying to raise funds for a new handbell, or a youth mission trip, and were a few hundred dollars short of our goal, it always seemed as though it was Graham who would step forward and put us over the top of our goal. He was always one of the first people to raise his hand and step forward to help with a new initiative and to encourage others in their work in and out of church. He will be deeply missed–a very dear soul! My condolences to Norman and family. I remember my mother, Verna Long, speaking very highly of her nephew Graham. I wish I had known him, we shared a love of piano and music. My condolences on the passing of Graham. As i read his obituary, I realized he attended B.U. at the same time as my dad. Graham was a great person, my mother and I would sometimes run in to him when I would come up from Florida to visit and take her out. He had a wonderful sense of humor, his laugh being one of the things I will remember most. You are all in my thoughts and prayers at this sad time.